Dr. James Edmonds was recently honored for his contribution to the Quadrennial Technology Review (QTR) that U.S. Under Secretary for Science and Energy Franklin M. Orr called, "one of the most comprehensive assessments ever completed" regarding our clean energy revolution. The QTR report examines energy technology opportunities that help the nation address our energy security, economic, and environmental challenges-including climate change. The report provides a comprehensive analysis of the energy technology landscape in the arenas of clean energy research and development. Edmonds is a Chief Scientist and Battelle Fellow working at the Pacific Northwest National Laboratory's Joint Global Change Research Institute (JGCRI), and Adjunct Professor of Public Policy at the University of Maryland at College Park. He also is the principal investigator for the Global Energy Technology Strategy Program, an international, public-private research collaboration. 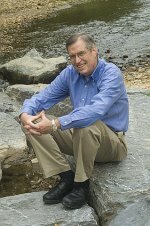 He has studied global energy, economy, and climate change for more than 30 years and has published numerous papers and several books, including his most recent one, Global Energy Technology Strategy, Addressing Climate Change. Edmonds is the intellectual leader of the Global Change Assessment Model (GCAM), developed over the past 30 years at PNNL with support from the Department of Energy. GCAM is designed to examine the consequences and responses to global change, and is used extensively in the U.S. and in global climate assessment modeling activities.